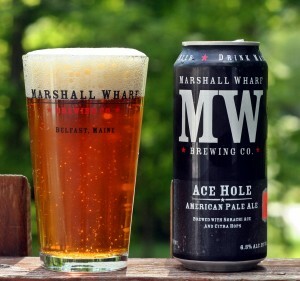 When Marshall Wharf announced they were going to can their beer they said it would start with Can’t Dog and then rotate through some of their many other beers. For the first 6+ months Can’t Dog was the only beer being canned and I can’t blame them as it was very well received and most beer stores had problems even keeping it on the shelf. Recently they decided to switch things up and started canning Ace Hole, a pale ale using a combination of Sorachi Ace and Citra hops. I have not had many beers that use Sorachi Ace so I wasn’t sure what to expect. Appearance is a bit darker than I expected with a thick tan head. There were a fair amount of floaties in the beer which I don’t mind but some people might. Aroma was ok with some lemon and pine. Taste is where this one lost me. I was expecting a fairly hoppy pale ale and I am not sure what I would call it. Odd mix of flavors possibly from the combination of the Citra and Sorachi Ace? Not only that but it had a substantial alcohol taste to it which I did not expect from a 6.4% pale ale. I have had quite a few beers from Marshall Wharf both on tap and in growlers and this is the first one that I did not care for. Normally even their high ABV beers mask the alcohol well (almost too well with Can’t Dog) but this one did not. Maybe I simply got a can from the end of the line but I am not sure I will give it another try to find out. Brewers Description: Our newest regular member of the pale ale lineup. Hopped with Sorachi Ace and Citra hops. My second beer from Alpine and I actually enjoyed this one more than Pure Hoppiness. That surprised me as I usually enjoy the bigger IPAs more and in this case it was just the opposite, both excellent beers but Duet is one of the best single IPAs I have tried. Appearance is fairly typical of an IPA other than the huge white head that went well above the rim of the glass. Aroma may be the best part of this beer with lots of grapefruit and citrus. Taste has loads of hops with the grapefruit, pine and some flowery hops as well. Just enough sweetness from the malts to balance things out. 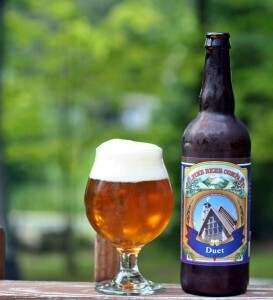 I really enjoyed this beer and would recommend you try anything from Alpine Beer Company based on my experience with Pure Hoppiness and Duet it seems like they are doing great things out of their small California brewery. To be fair to this beer I did not give it a rating and will not review the taste, etc as the bottle was 6 months old when I opened it and I am certain it was well past its prime. I generally enjoy beer from Slumbrew and as you know I like Double IPAs so I had high hopes for this one before I realized it was old. Hoping they release this again this winter so I can try a fresh bottle and update the review accordingly. This is another brewery that is new to me and also another that came from my New Hampshire connection that does a lot of trading. 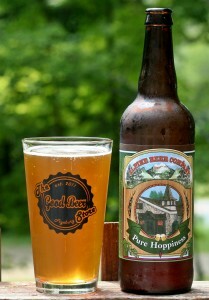 Alpine Beer Company is a small brewery in California that appears to be making some very good in a variety of styles. According to their site they make high quality ales, lagers and sours. Based solely on the two beers I have had from them I have to agree. Pure Hoppiness is their double IPA which clocks in at a solid 8% ABV. Appearance is OK with almost no head. Aroma is better than the appearance as there are lots of piney hops, some citrus and sweet malts as well but I got mostly pine. Taste is where this one excels with the pine hops from the nose but also a fair amount of citrus that is very well balanced with what must be a big malt bill. This is not a palate wrecking over the top hop bomb just a very solid, well balanced and very drinkable double IPA. While I enjoy beers that are over the top hoppy I also enjoy well balanced beers like Pure Hoppiness. Excited to try more from Alpine Beer Company. Brewers Description: This brew uses several varieties and multiple hop additions to the kettle as well as a large “hop back” to give the bitterness and aroma a start. Plenty of dry hops finish it off and give a big hop bouquet. Another bottle from a New Hampshire friend that traded for some Kern River beer from California. Kern River’s Citra DIPA is one of only two beers to receive 5 stars so far so I had high expectations for this beer. Not surprisingly this one did not quite measure up but it is still an excellent beer. This is a beautiful beer, slightly hazy orange with a solid two finger white head. Aroma has plenty of hops including some flower, grapefruit and pine. Taste is very well balanced with plenty of citrus and grapefruit with just enough malt sweetness to keep things in check. A really enjoyable IPA that I wish I could purchase on a regular basis. This one falls somewhere between Lunch and Another One from Maine Beer Company. If you know anyone in California that can get you something from Kern River take them up on it and if you get an extra keep me in mind. Brewers Description: This India Pale Ale has a strong malt character and a large hop profile. We dry hop this beer with Simcoe and Amarillo hops to give it that great floral aroma and citrus finish. If you like a strong IPA, you’ll find this one just outstanding. Picked this one up in an exchange with a good beer friend and he was amazed that I had not tried it before now. After seeing how popular this beer is I am surprised it took me two years of beer blogging before getting my hands on one. Flower Power is very close to being a double IPA at 7.5% so it is right up my alley as far as beer styles go. Unlike most other beers I drink this one actually comes in 12 oz bottles which was a nice change from the bombers and growlers I usually drink from. Appearance is pretty typical of the style; a nice orange color with a single finger bright white head. Aroma has plenty of grapefruit and a lot of flowers – guess that is where the name comes from. Taste is very similar to the aroma with a light bitterness in the finish. 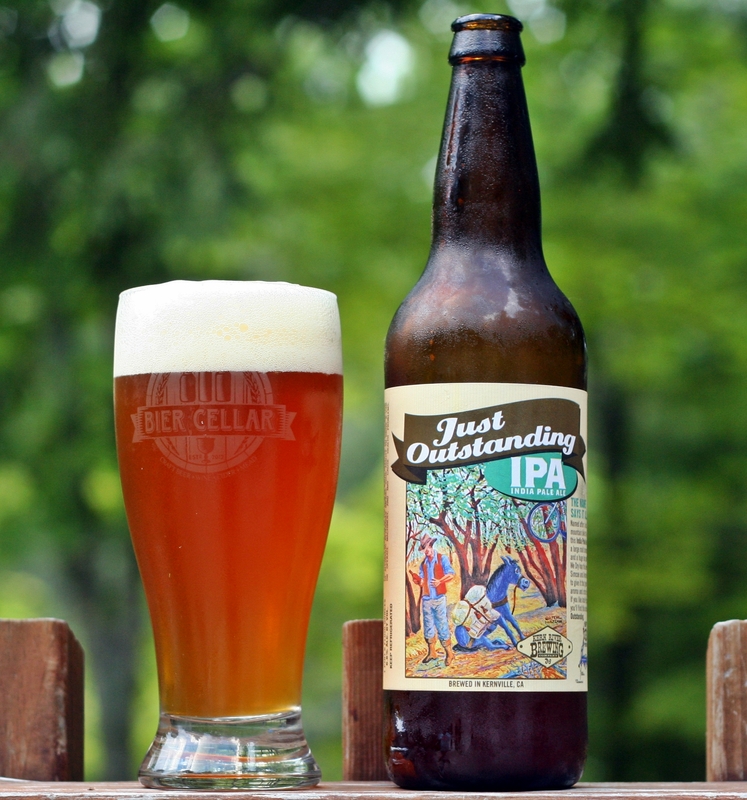 Overall a very nice IPA that I would enjoy drinking on a regular basis if it were available in Maine. Brewers Description: Enjoy the clover honey hue and tropical nose. Simultaneously Punchy and soothing with a big body and a finish that boasts pineapple and grapefruit. Flower power is hopped and dry-hopped five different times throughout the brewing and fermentation process. Got this beer as part of a local exchange with a follower from Mass that came up for a bottle release at Allagash a few weeks back. War is part of Backlash’s Apocolypse Series and is a saison. The label artwork is amazing as is most of the packaging from Backlash. Was sorry to see they discontinued the wax dipped bottle top but still love what Backlash is doing. Beer is a nice orange color with a very nice bright white head. Aroma is OK with some Belgian and earthy smells. Overall a pretty appealing beer. Taste was different than I expected with a lot of different things going on; some grassy hops. Belgian yeast, spice, pepper and a mild sweetness from the rye. This sounds like an odd mix but it seems to work. 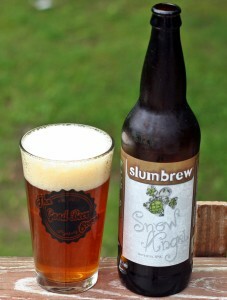 This beer was very easy to drink and I enjoyed the combination of flavors. If you come across a bottle give it a try and let me know your thoughts. 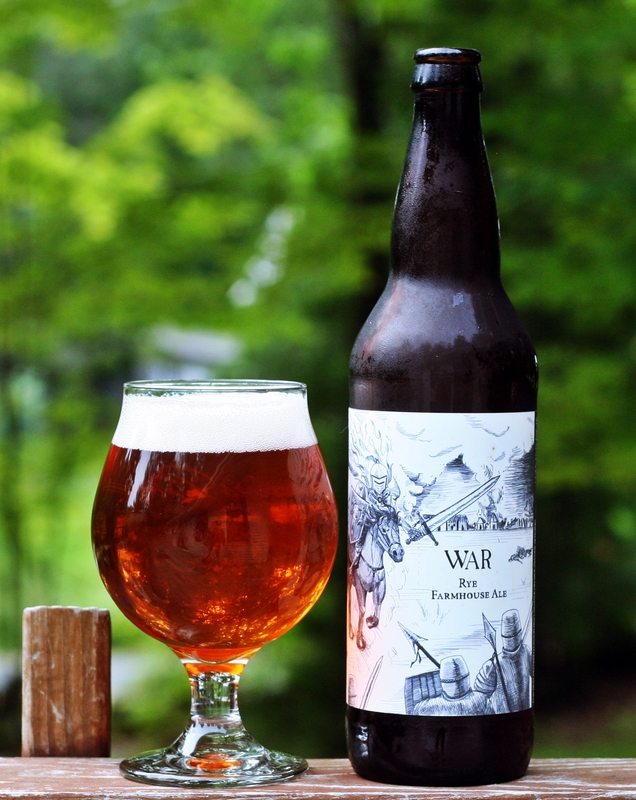 Brewers Description: War is the second beer in our Apocalypse Series. Each beer is modeled after one of the Four Horsemen of the apocalypse. This Farmhouse Ale was dry hopped with hibiscus leaves to represent the red horse of war, the second of the four who precede the end of the world. Using three different Belgian yeasts, this beer presents classic farmhouse tartness, complemented by earthy and grassy notes. Label text: Still reeling from the devastation that Conquest left behind? That’s a pity, because the second brother is on his way and ready to rumble. War is rolling into town on a red horse with a big ol’ sword in hand (and no, he’s not compensating for anything). There’s no stopping this guy so you might as well take up arms and enjoy the fight. Side note: please don’t get carried away and use this bottle as an improvised weapon. This beer is very dark with a thin off white head. Aromas is mild with some coffee notes. Taste follows with a solid coffee flavor and some other roasted malts. Seemed a bit thin for such a dark beer but overall it was enjoyable and something I would certainly try again. 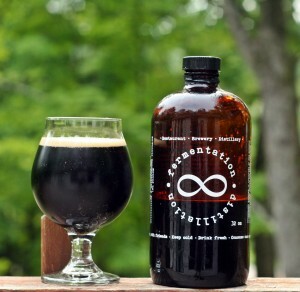 Brewers Description: In collaboration with Warren Cathro of Toronto. Black as night, light bodies with roasty notes of coffee and a touch of hops. Smooth yeast character from our “house” Trappist yeast. I grabbed a growler of this on one of my recent trips to Vermont. After stopping at the brewery and tasting several beers I opted for this saison over some their bigger beers as it is 64 ounces and I was planning stops at The Alchemist and Hill Farmstead in addition to Rock Art. 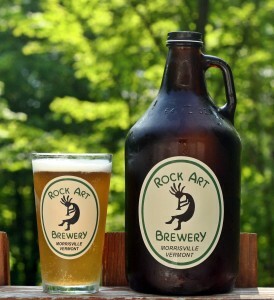 I believe this is a brewery only beer as I cannot find much info about it online and it is not even listed on Rock Art’s website. Saisons are quickly becoming one of my favorite summer time styles as a lot of breweries are adding them to their line up. This one from Rock Art is a fairly simple version of a saison with no funk like you often get from Oxbow and others. The color is typical, pale orange, nice white head. Aroma has a bit of fruit and earthy yeast but nothing too exciting. Taste follows with some mild spice, a very slight bitterness but a clean finish that leaves you wanting more. Rock Art’s Saison would be a great introduction to the style for beer drinkers looking for something new. If you enjoy this one then you can move on to some of the more daring saison from other breweries. 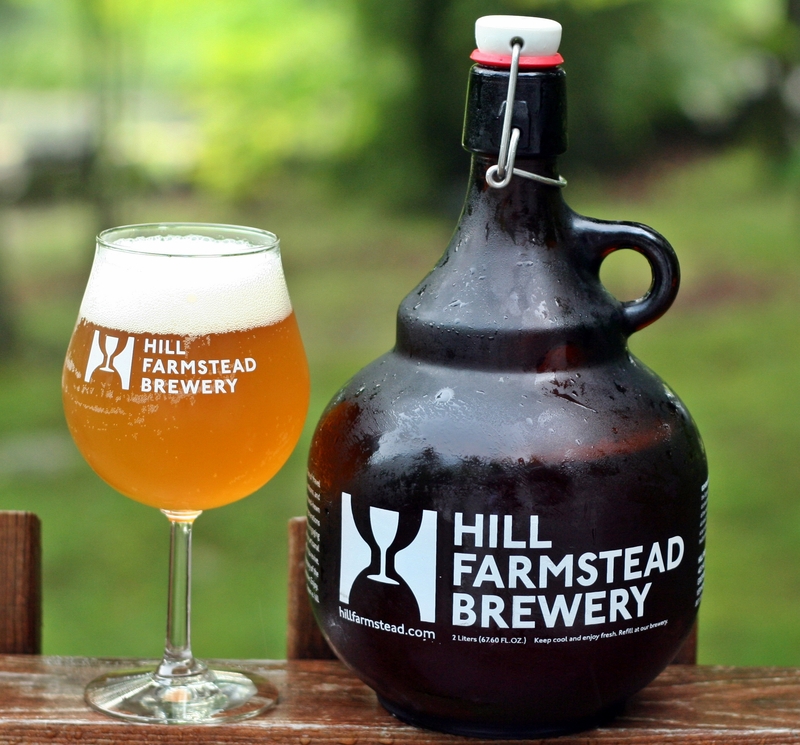 I know I am starting to sound like a broken record but I love double IPAs and Hill Farmstead is certainly making some of the best and more of them than most breweries. Picked up a full 2 liter growler of Society & Solitude #3 on my last visit and I’m glad I went for the full 2 liter. This beer has a similar appearance to most of Hill’s hoppy beers with a nice unfiltered orange color and thick white head. Aroma has lots of grapefruit, citrus and some pine. Overall this one gets high marks before I have even tasted it. The taste is the best part though with huge hop flavor; citrus, grapefruit and pine all come through with a fair amount of bitterness that does not linger too long. Mouthfeel is excellent leaving a slight oily film. 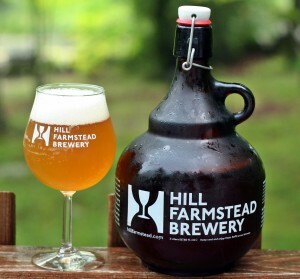 Overall another excellent DIPA from Hill Farmstead. 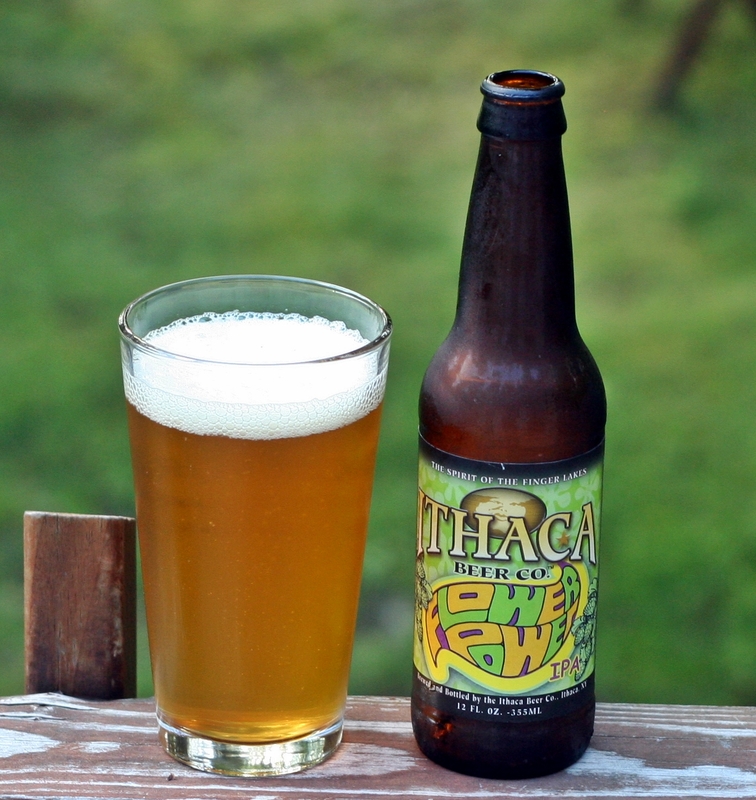 Brewers Description: The series of experimental Double IPAs continues. 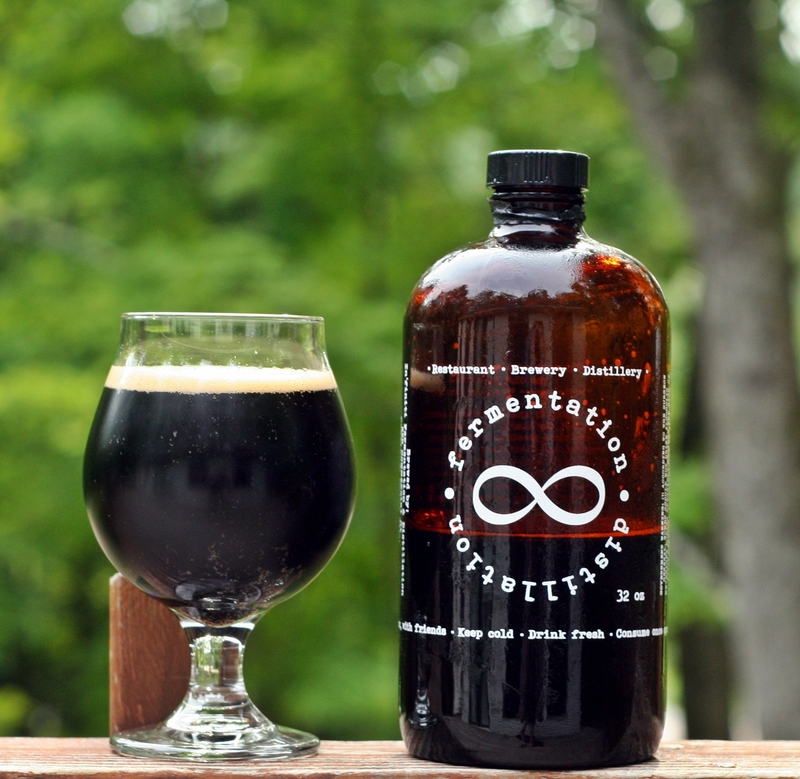 This one is hopped with ample amounts of Columbus and is reminiscent of… an Imperial Harlan?